In the first of a regular series, we’d like to introduce you to our T&W friends, people who in our humble opinion have not only superb style but mix their interior finds in a very unique and individual way. We'll give them a pop quiz to find out about their personal style philosophy, and also take you inside their home for a slice of their world. Verity Magdalino met Cassandra Karinsky, founder and owner of textile and furnishings label, Kulchi. 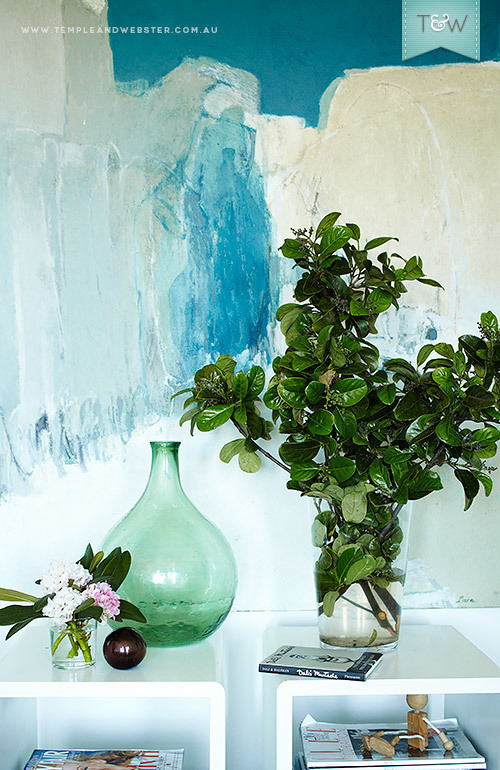 You can see some of Kulchi's Moroccan treasures in Karen McCartney's current Editor's Collection sale event, and the images we shot in Cassie's Sydney apartment demonstrate the beauty of handcrafted homewares, especially in a contemporary setting. Profession: My background is in restaurants but when I went to Morocco it opened up so many ideas. It’s such a creative place. I started making kaftans, had a shop in the Medina, and helped a photographer friend source locations for interiors magazines, which led me to writing and styling for Elle Décor Group and Maison Francaise, and eventually to my own interior decorating business. I launched Kulchi, meaning ‘everything’ in Arabic, in Sydney earlier this year. 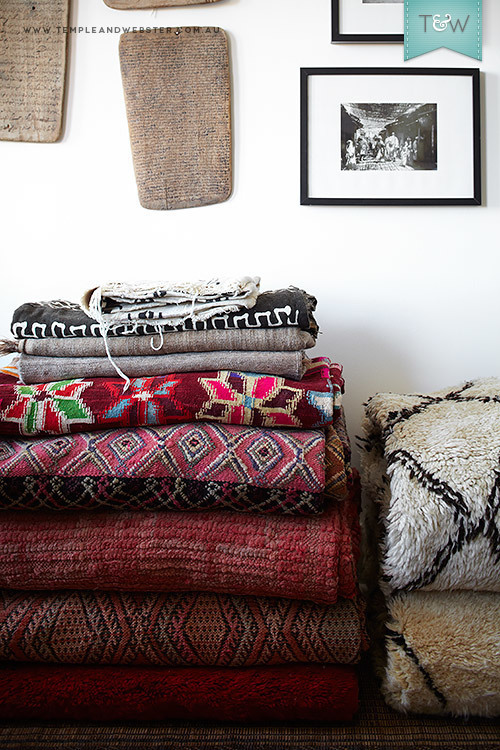 It came from wanting to share all the things I love from Morocco; the simple beauty of natural products like handmade wooden stools and the Beni Ouarain carpets made from wool spun in local homes in the mountains. From: Sydney originally but after living six years in Morocco I now travel between my home here in the Eastern suburbs, Marrakech, and where my sister lives in Madrid. Favourite colour: Turquoise. It reminds me of flying into Sydney and that beautiful coastline. Favourite word /sentence: ‘Safi’, which means ‘enough’ in Arabic. It’s a necessity in Morocco. Favourite artist (musician, designer, writer…): I love Egon Schiele, the way he sketches, his lines are so confident. And the poetry of Nick Cave. Favourite Temple & Webster piece: I love the colour of the Stoneleigh & Roberson teal glass bottle - to me, it captures the Sydney summer. The Stoneleigh & Roberson industrial style entertainment unit would look great against the black & white tiles in my bathroom, plus it would be the perfect place to house all my towels. I can never have enough storage. What do you obsess about? Nothing really. I’ve lived everything I’ve wanted to do. But every time I go looking for carpets I’ve got to have every one I see. I wouldn’t live without a carpet. Where do you go for inspiration? Marrakech and the souks. I love the energy and the grit. I love speaking Arabic and the whole process of sourcing for clients, having tea with suppliers and chatting. There’s an upfront honesty with the people there. What do you love most about your home? I really love the outlook here. It’s quite private. There’s a beautiful willow, which I can see from my bedroom, and I love the natural light. The apartment is so central, and yet very peaceful. What’s your favourite object? I’ve learnt to live a very humble existence after living in Morocco. I don’t get that attached to things. There are things that I love, like the Beni Ouarains, the Mauritanian mats, and the vibrant colours of the older carpets. They all have a story to them with motifs and symbols that tell the woman’s tale of when she’s making that carpet. If you have one styling tip, what would it be? I always have to paint my walls white. It’s so fresh and clean, and I prefer to play with pops of colour. What’s been your biggest interior mistake? I designed a table for my kitchen in my Tangier apartment that didn’t work. The legs were the wrong proportions. You have to get everything made in Morocco, couches, everything. The table really bummed me out. It wasn’t cheap. What are you working on at the moment? The African stools are new, and I’m also doing some African-inspired coffee tables in different colours. I may design some carpets. I want to create different shapes but stay true to the traditional Moroccan motifs and symbols. Life motto: ‘Live in the moment’. In Morocco they do it to a fault. Having lived abroad and been exposed to that I appreciate a lot more of my life and what I have. 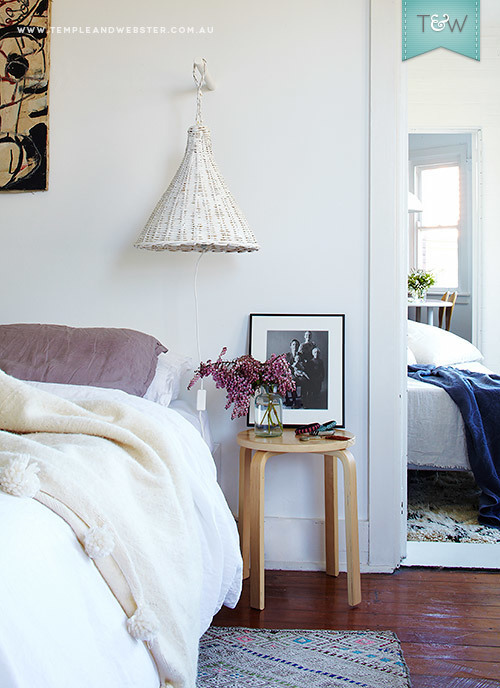 On my bed I have a Kulchi pom pom blanket, on the floor, one of my favourite Zaer kilims from the Zaiane region, and I love my hand-woven lampshades, which I had made in Morocco. A carpenter friend installed them for me. They create a beautifully subtle light. A handcrafted African stool in the hallway is one of the latest additions to the Kulchi range - I had it painted in canary yellow . I love things with history and meaning behind them like my carpets, the antique wooden Koran tablets on my walls and the photographs of Morocco re-printed by a friend from original 19th century negatives. The gold throw is a traditional Berber wedding blanket, which is worn as a cape during the wedding ceremony. It’s hand-loomed from 100% wool then decorated by hand with sequins. The background painting is called 'O Camino' by Mora. I purchased this in Cadiz, Spain, on the promenade of the local beach there. The vase is a gift from one of my carpet suppliers. 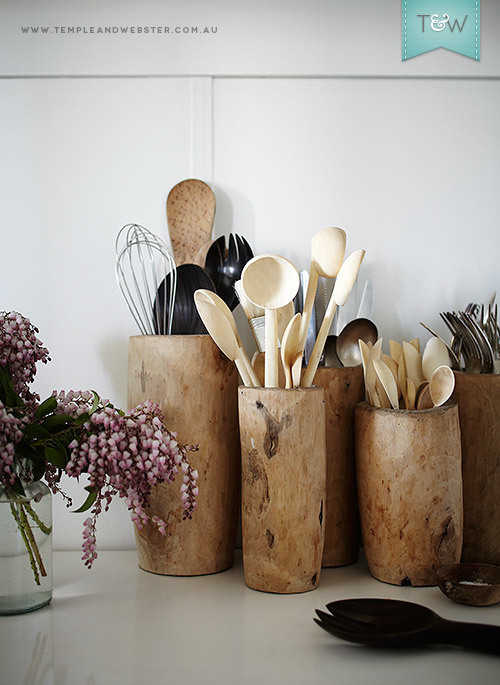 The eucalyptus wood utensils and hand-carved containers in the kitchen are everyday ‘Beldi’ pieces, which basically means ‘country’ in Arabic. I love all things Beldi! 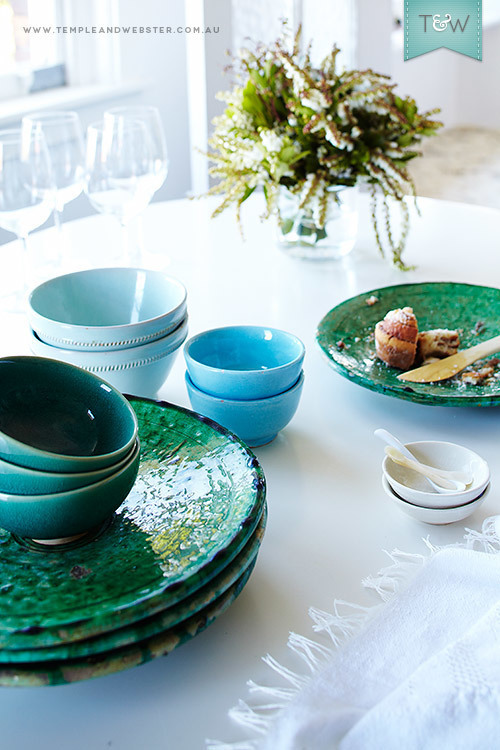 The green plates are traditional of the Tamagroute region and the pale blue bowls I found at Bab el Khemis, the local flea market in Marrakech. The embroidered throw is very traditional and sometimes worn by the women in North Morocco, wrapped around their waist over skirts. It’s hand-loomed from the Tanger Tissurand. I love this place! It’s where I go to design new pieces. 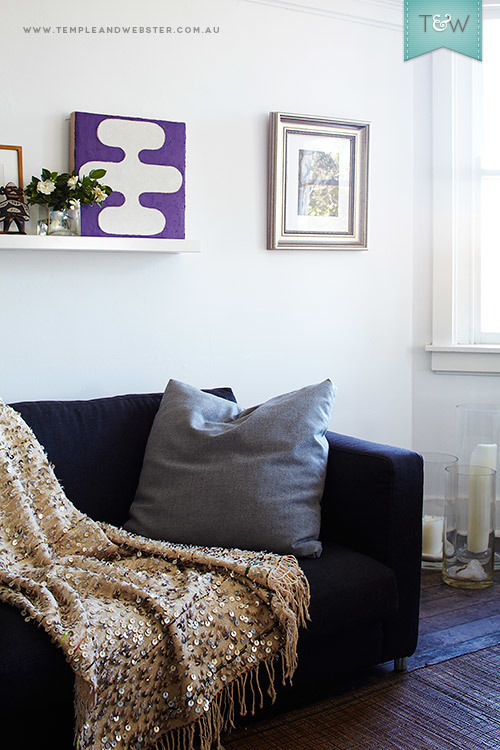 They also make amazing hand-loomed rugs in whatever colour of wool you want. Want more? 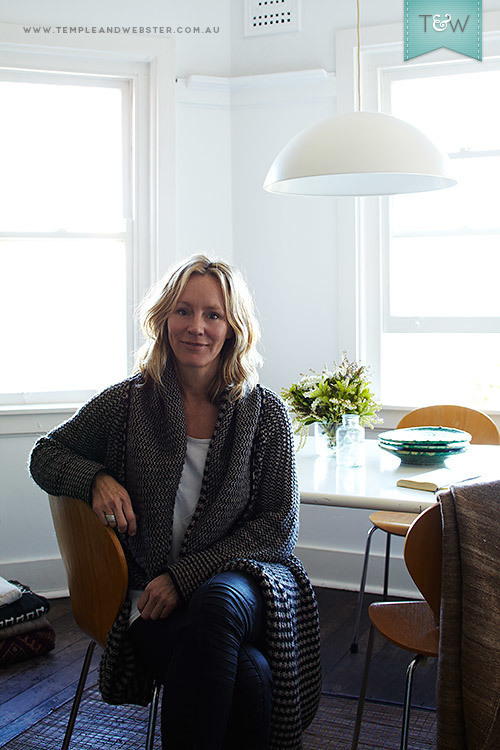 Visit Karen McCartney's The Editor's Collection now for some beautiful Kulchi pieces including a Beni Ouarain rug, or visit the Kulchi website to see more of Cassie's style.